The term is whizzing by and we at Hedley are gearing up for the Halloween Spooktacular that is our annual Witches Walk, this year we are meeting at the “big steps” just inside the side gate of Merrion Square at 11.30am on Friday October 28th. It’s a lovely high note on which to begin our half day to the first midterm of the academic year. Bats, Newts and a box of Frogs, thats some lunch list Ms Witch! 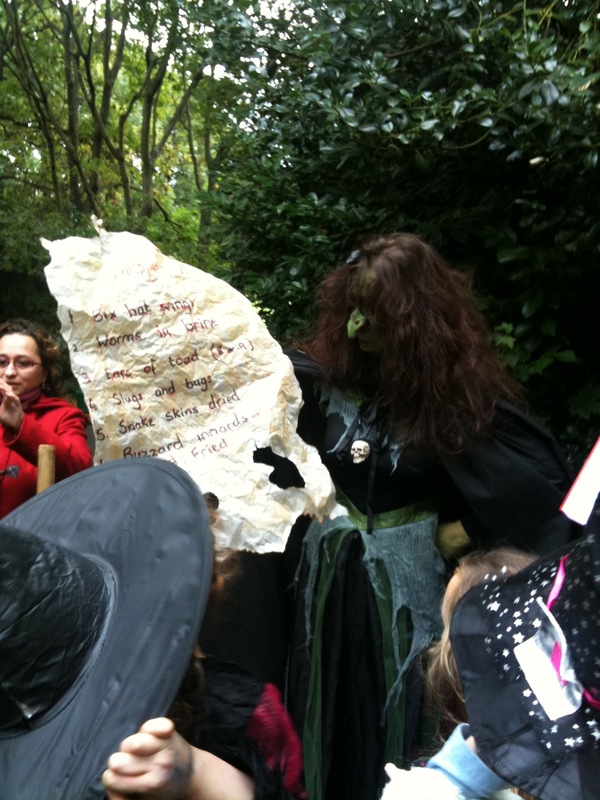 Parents are reminded that our midterm break begins after the Witches Walk; so all children are to bring a small snack and no lunch on the day. The air can be nippy this time of year so costume wearers should remember warm undergarments, tights or a wizardly cloak to keep away the chill on our hunt! On the topic of keeping in good health, a note about our “Healthy Hearty Lunch Policy”. As you are aware we encourage fruit and veg, fresh milk or plain water and balanced protein and carbohydrate lunches and snacks only. We offer food heating for those who prefer their child to enjoy a hot lunch, but sometimes a cold choice of colorful food groups are more appetizing to a young child. We all want to give our children a balanced and enticing lunch but sometimes inspiration can be hard, when you are tired, under time pressure and perhaps stuck in a rut. I found this great website with lunch box ideas that are sure to get even the pickiest eaters bitten by the “bento box” bug. I’ve included a couple of my favorites, but go check out Wendolina’s blog for yourself! Here is her_Lunch_Box_Idea_List Save it and print it out, then pin it to the fridge. This takes the pain out of packed lunches just make sure you have 2 from the carbs, 1 from the protein, 2 fruit, 2 veg and a little bit of dairy, to keep those bones strong. Scrumptious snack time awaits! Our last food related note is another of the annual Hedley Park events, The Big Breakfast Together. It takes place on the morning of Thursday, 18th November. There will be lots of healthy breakfast fare, and some special treats to share so make sure you pencil it in. It’s a lovely morning and all the family are welcome to come spend some time together in Hedley with us all. I’m sure by now all you parents are aware of our drama selection for The Christmas Show. Last year it was a “Pirates Life for Me” with Peter Pan but this year, “You can Consider Yourself One of Us!” as we are all living the life of Oliver! 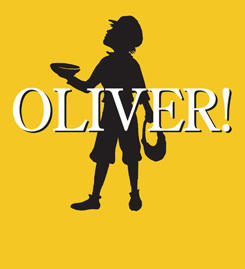 in the West End adaptation of Charles Dickens’s novel Oliver Twist. It will be a “Fine Life” watching Fagins gang, “Picking a Pocket or Two” and I for one will “Do Anything” to be there, in the Pavillion Theatre on the day itself. The Dress Rehearsal is planned for Wednesday 7th December (All children from Junior Infants upwards must attend the theatre) there will be school as normal for the preschool children. The Grand Performance will be Thursday 15th December, all staff and pupils will be required to meet at the theatre that day as the school building will be closed. I know this won’t be the last you’ll hear of our grand performance, but it’s time now to mark those days on the planner to make sure you miss nothing of the action! Hedley's Beanies mean Warm Ears! Finally don’t forget, as the weather turns crisper we should wrap up warm for our daily park outings. Last years popular beanie hats are back again, and keep those ears toasty warm. Our school scarf, and the warm wool winter overcoat along with an extra pair of thick socks in our Wellington boots keep jack frost at bay as we hunt for acorns and horse chestnuts! Warmest Wishes from the Staff and Students at Hedley Park. PS. On Monday of this week we passed 9,000 views of the blog, so I want to say a quick thank you to you all. In a little over 12months of posting thats a really great stat for viewership, so thanks again for reading our blog and passing it on to friends and family. I personally love sharing the work of our young learners and its wonderful to know people are enjoying reading it! Thank You! Jumping right into the new academic year! Our senior prep school class have certainly jumped into learning with both feet! We have so much news to share with you, September has been a busy, happy and productive month for everyone in Hedley park. Firstly welcome to all our new friends and their families, we are delighted to have you in our Hedley Family. I’m sure you feel right at home by now and that’s when the fun really begins! And to our old friends we are glad you all had a great summer and cant wait to show off all you’ve done this month. 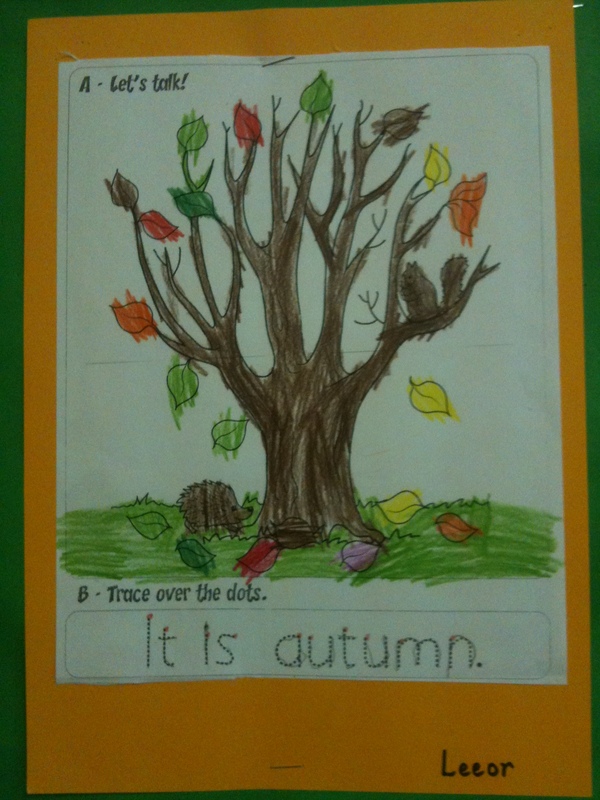 Learning about the Seasons through art and colour. We will start with the preschool group, its been great to welcome so many little brothers and sisters of our pupils in the prep school group. While Hedley does have a strong family feeling in general, nothing beats actually having your brothers and sisters close at hand to share in the fun. On the “new” theme, the preschool room got a summer makeover and sports a fantastic new home corner area and loads more notice board space to display all the work our littlest ones are doing. If you haven’t done so already, give us a call and come take a look! Through September the Preschool group have been learning about many themes, Autumn, South America, and Weather being the main ones. Aside from the traditional academic, sounds and numbers for preschool, the Monetsssori environment places an emphasis on assisting young children to understand world cultures, geography, natural sciences and the society they live in. This is achieved through art, music, story and movement. 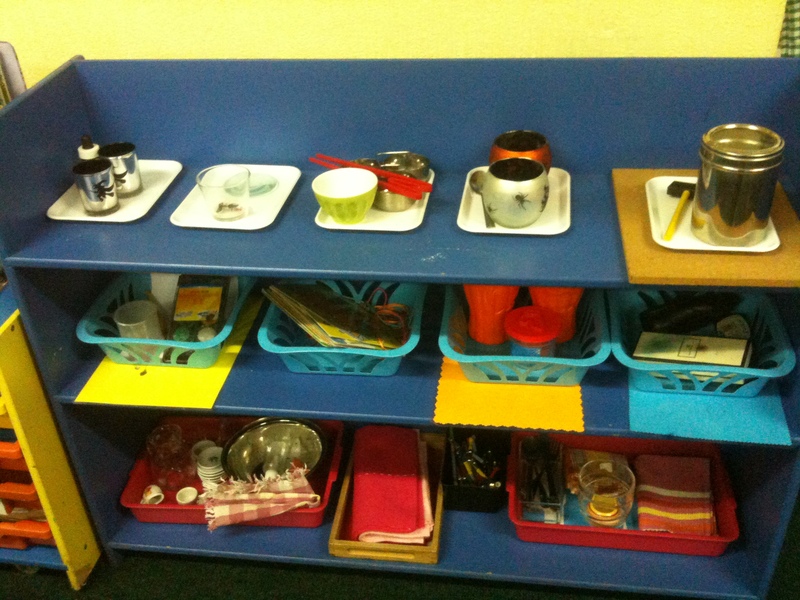 But particular to Montessori is the exploration of these themes through the senses. Exploring the properties of 3D geometric shapes. Do they roll? Do they have sides or edges? Using touch, taste, smell, sight, and hearing young children absorb the physical impressions of world around them and use these later as the foundations and cornerstones of all the abstract information older children and adults process. 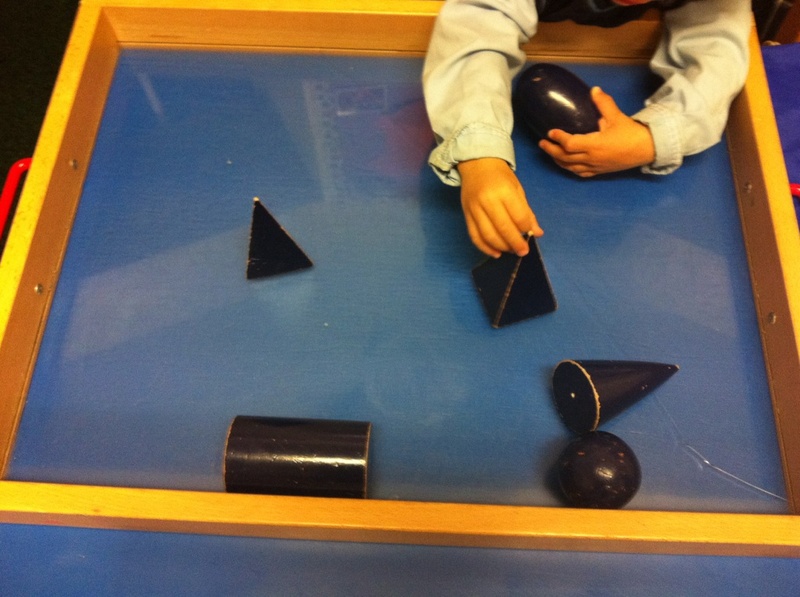 In the Montessori school there are materials created to provide this input to the child and assist the child in really creating the strong logical framework it needs to be an independent and active learner. 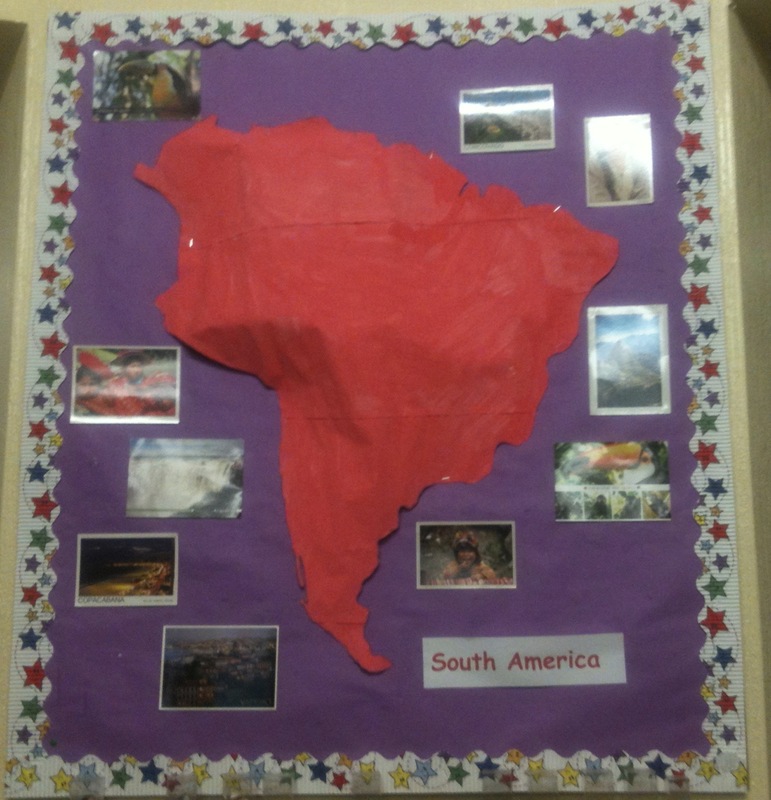 Group Painting the South American Continent: a social and physical learning experience. South America was the focus of our geographic trip around the globe for September. As you may know Montessori colour codes the seven continents, this helps young learners to classify and connect the learning and images related to each continent. Allowing for quicker recall and better connection of plants, animals, people and traditions of each continent. 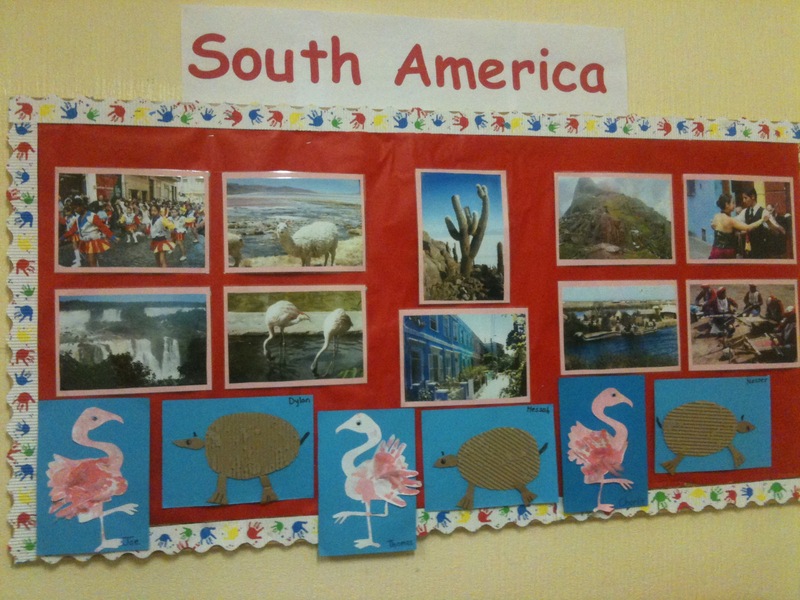 Pink is the colour of the South American continent and with the help of our teachers, the preschool group painted a huge mountainous continent for our notice board. Take a trip to Sunny South America! 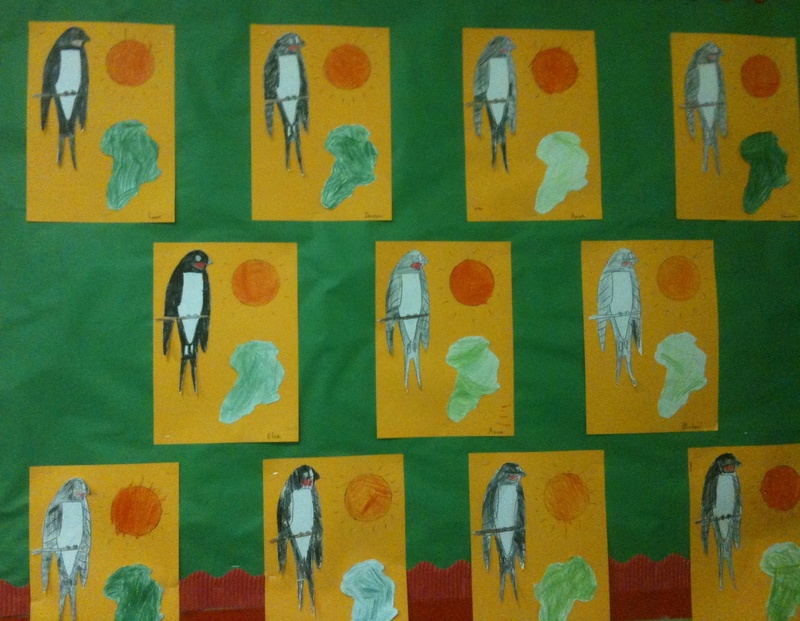 Another amazingly fun project got the preschoolers talking and exploring the weather through art. 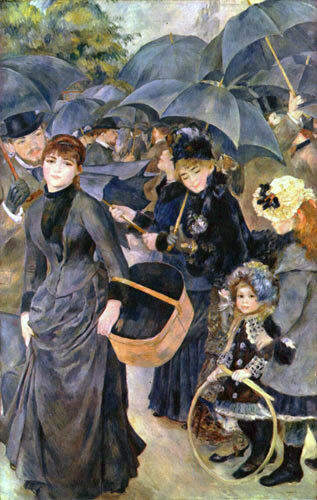 Using Renoirs “Les Parapluies” as an inspiration, we talked about rain! What rain felt like? What rain sounded like? What a rainy day looked like? What clothes we would wear? What things we would need? All great topics to expand vocabulary and enhance listening and speaking skills in the group. 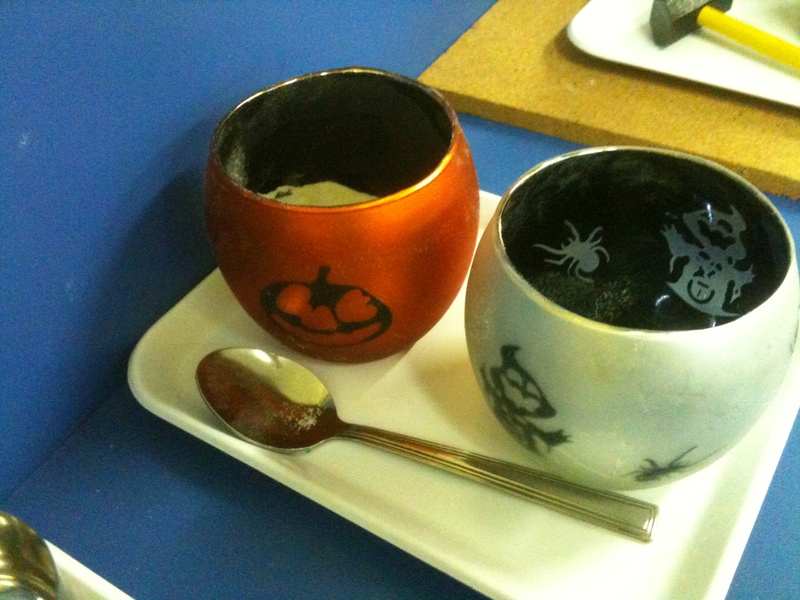 Then we made our own version. We are sure you will agree the feeling and ambiance of a rainy day is captured perfectly! 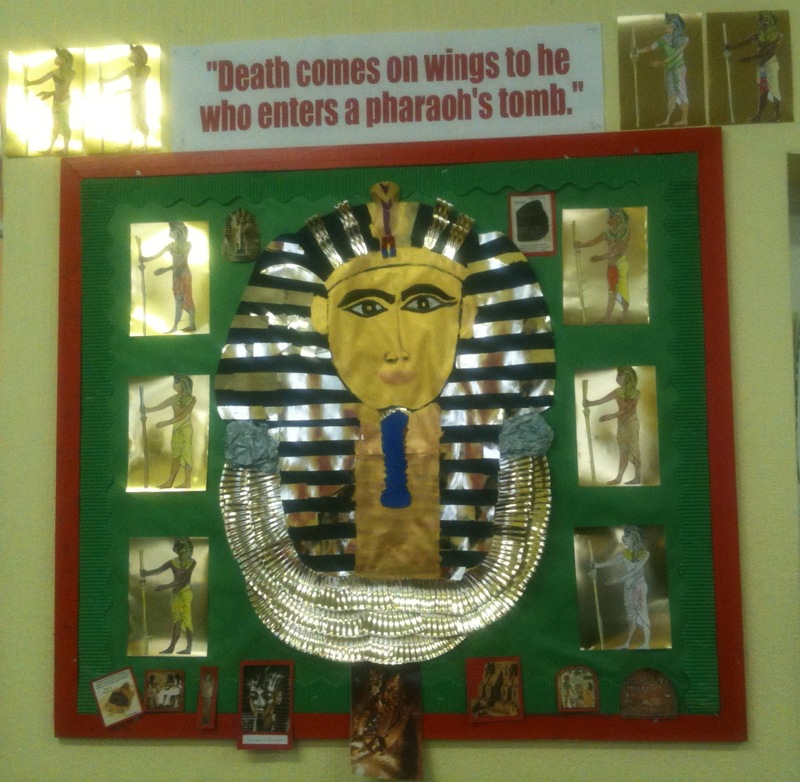 Prep Schoolers learn about the Wonders of Ancient Egypt. 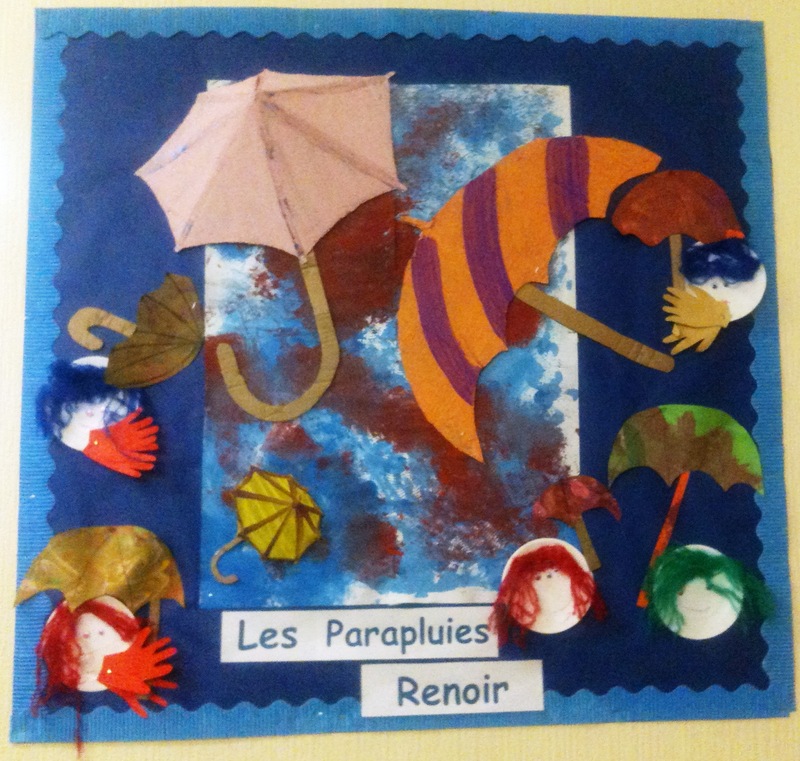 In the preparatory school group Aoife & Katie’s class have been busy beavering around too! Enjoying the mixed age range in this class, with the older ones helping the younger ones. It really is true what they say, you remember 90% of what you teach someone else to do, experiential learning has been a big feature of the work of the junior prep school class. Montessori classes have a mixed age range from each plane of development, knowing that younger children watch older ones looking for example, this n turn inspires the older children to be more responsible, assisting the younger children enhances self esteem and providing the social cohesion of a caring learning environment. Swish! 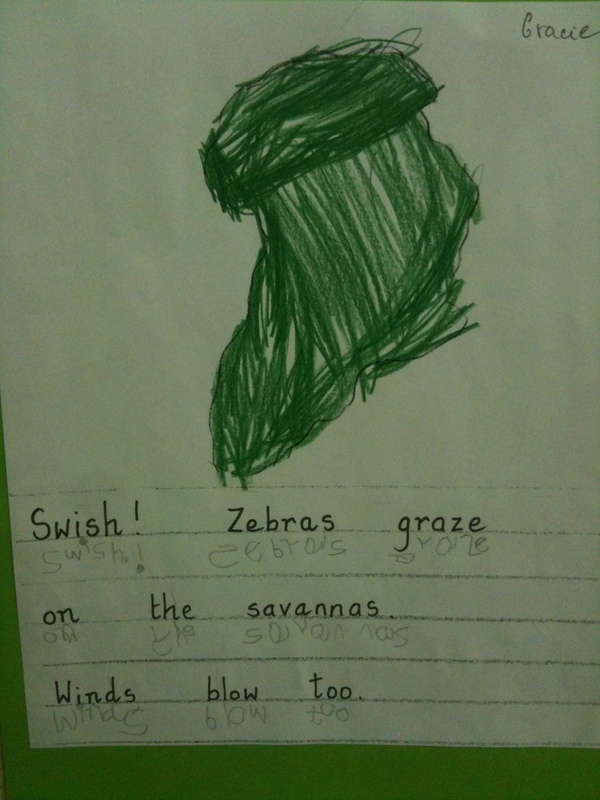 Great African themed handwriting sample! The group learning themes this month have been The African Continent, (coded green) Ancient Egypt, Autumn and our phonogram “Sh” and the sound “C”. Autumnal Leaves! Displaying great pencil skills. Everyone is enjoying the discussions, art, song and story during group work and circle time, but personally I am really impressed with the personal handwriting and colouring work from these young students. 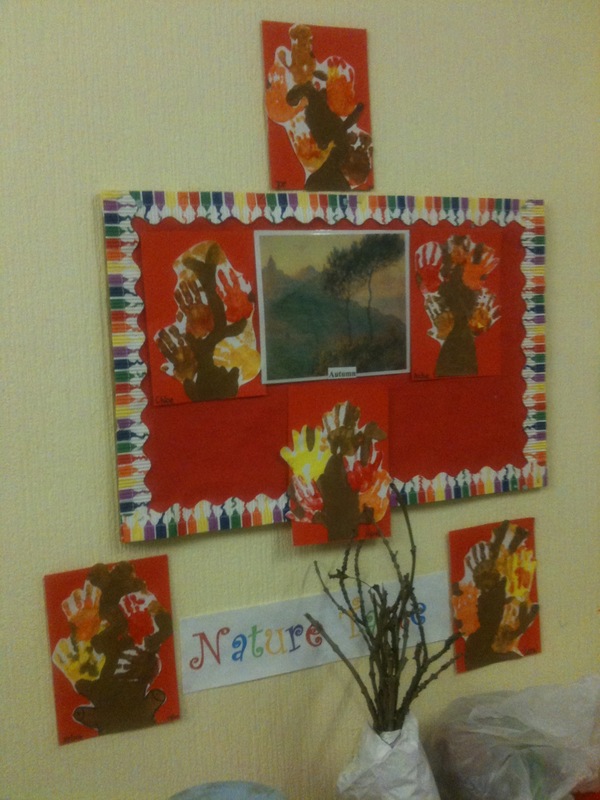 Africa Wall Display, lots of fine motor skills needed: colouring, cutting, glueing! Practical life, a wonderful staple of the Montessori environment has been given a seasonal update. Practical live allows the younger child to gain independence and fine motor skills, and in the older child it enhances concentration and raises self esteem through accomplishment of interesting and detailed tasks. Halloween spooning. Enhancing hand-eye coordination and fine motor skills. Witchy Eyedropping Work. Eydroppers strengthen fingers and utilise the pincer grip essential for handwriting. Last but by no means least, our senior prep school group in Ashley’s class have indeed jumped right in! 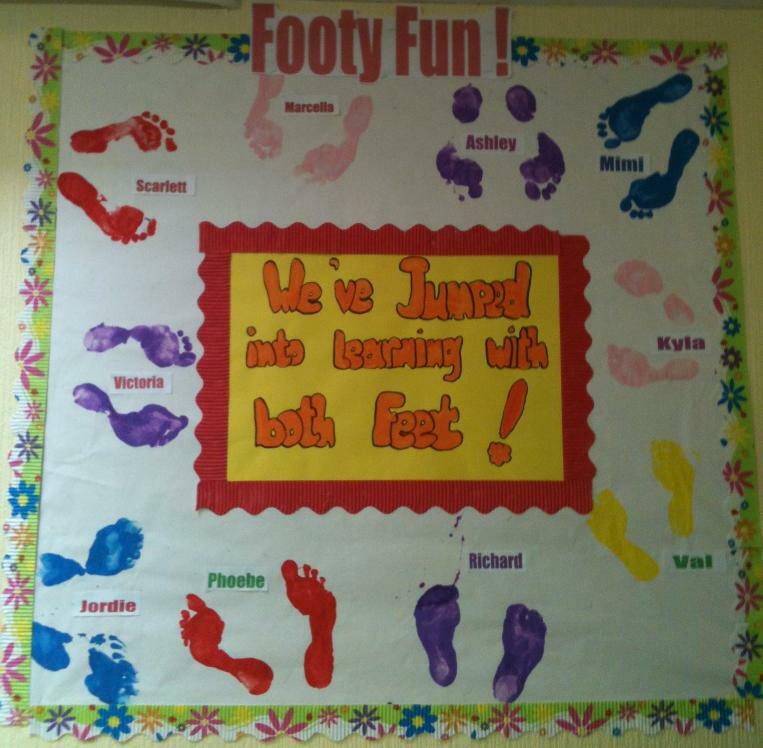 You can see from their fabulous “Footy Fun” display board (also at the top of the page). This was a fantastic team building experience for the new “big kids” to be welcomed by their more seasoned senior class colleagues. Everyone got to experience a mini spa, as shoes and socks were discarded and painted feet left their mark. Highlighting that even down to our toes everyone is unique, our differing feet impressions were lots of fun to create. A nice aside to this was a small lesson in “care of self” as foot washing and drying finished the group work nicely. Well done to all you really did put your best foot forward! Aside from their extensive individual learning the senior class have been working on three projects. Family Trees, Properties and Characteristics of various materials, and finally Story telling and Writing. Our Family Trees! Colourful and Significant. The family tree project saw, history taking on a very personal journey. 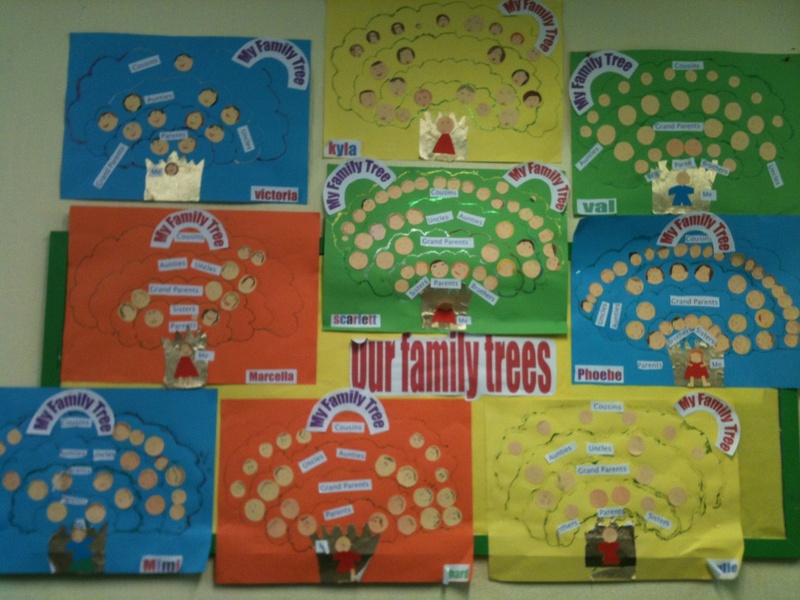 Each child took time to talk to family members and classify each segment of their family tree. This is a great project for the older class, who are developmentally very aware of their position and place in the greater family and relative structure. It promotes a feeling of belonging that is central to self image. In science the junior experimenters have been exploring the properties of materials. What better way to find out about a material than to add something to it. Letting the students predict what may happen, then observe and record their findings. It is this concrete emphasis on the steps involved in the scientific approach that will assist these young minds to really take in what is necessary to explore the world in a scientific manner. 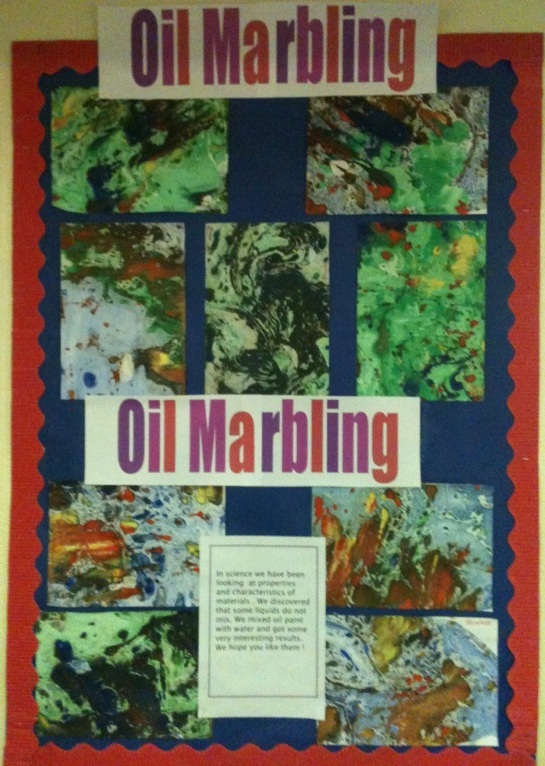 They tried their hand at oil marbling with great success. 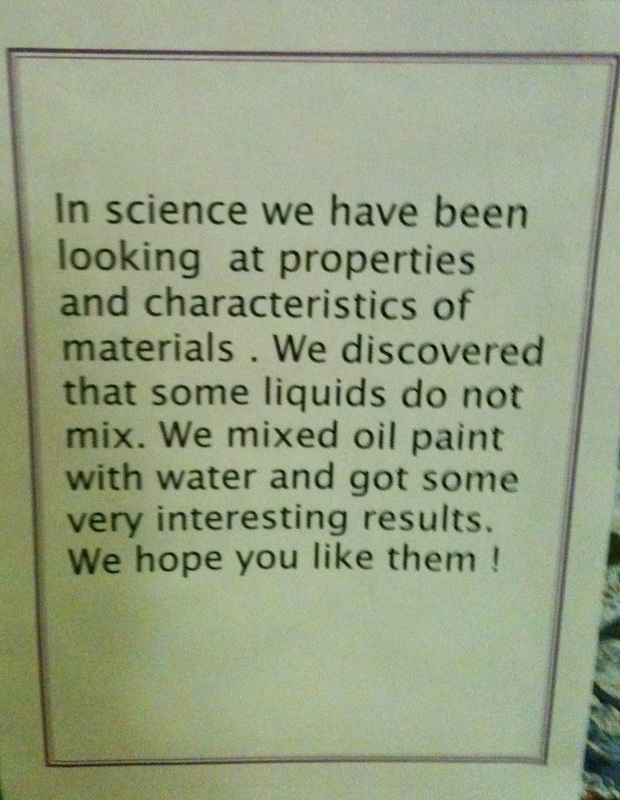 They also created a wave bottle, which was great fun until it fell and broke on the carpet. But all proving to be valuable physical property based learning experiences. Oil + Paint + Water + Paper = Art! The final group project involved literature and an interesting community based twist. 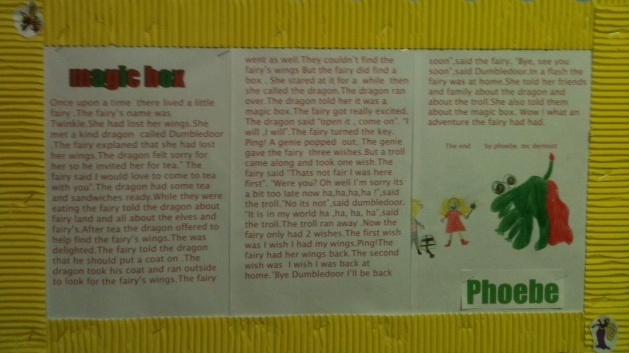 The students used their imaginations, and IT skills to compose and print fairy tales of their own creation. Once the stories were complete the senior class authors had a “story time” for their younger school mates. This proved very popular and was enjoyed by all. Knowing the senior class it’s just the first of many creative sharing experiences they will lead for the whole school to enjoy! 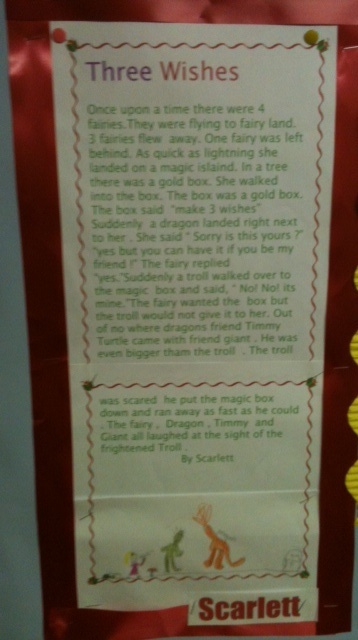 The Magic Box written and illustrated by Phoebe. Thanks for stopping by, as you can see we’ve been really busy. We look forward to showing you our work from October very soon. 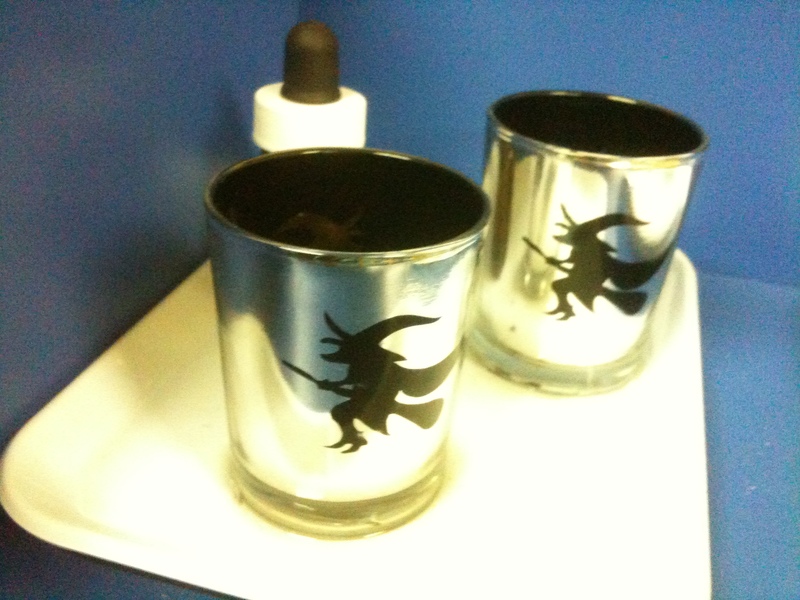 Don’t forget to keep your eyes on the Facebook page for detail of this years “Super Spooky Witches Walk”.